Maurice Herbert Evans (3 June 1901 – 12 March 1989) was a British actor, noted for his interpretations of Shakespearean characters. His best-known screen roles are Dr. Zaius in the 1968 film Planet of the Apes and as Samantha Stephens's father, Maurice, on Bewitched. Evans was born at 28 Icen Way (where there is now a memorial plaque, unveiled in 2013 by Tegen Evans, his great-great niece) in Dorchester, Dorset. He was the son of Laura (Turner) and Alfred Herbert Evans, a Welsh dispensing chemist and keen amateur actor who made adaptations of novels by Thomas Hardy for the local amateur company. Hardy lived in Dorchester and thought highly of Evans's adaptations and productions. Young Maurice made his first stage appearance as a small boy in Far from the Madding Crowd. He first appeared on the stage in 1926 at the Cambridge Festival Theatre and joined the Old Vic Company in 1934, playing Hamlet, Richard II and Iago. He was selected by Terence Gray to appear in the opening production in November 1926 at the Festival Theatre, taking the part of Orestes in two parts of the sensational production of the Oresteia of Aeschylus. This was followed by Lord Belvoir in The Man Who Ate the Popomack by W.J. Turner, and Saint Anthony in Maeterlinck's The Miracle of Saint Anthony. In 1927, Evans played a poet in The Pleasure Garden by Beatrice Mayor followed by Young Man in On Baile's Strand by W. B. Yeats, Midir in The Immortal Hour by Fiona Macleod, the Hon. Algernon Moodie in The Rumour by C.K. Munro, Mark Ingestire in Sweeney Todd by Dibdin Pitt, the poet in The Lost Silk Hat by Lord Dunsany, the Captain in Androcles and the Lion by George Bernard Shaw, Mister Four and Young Man in The Adding Machine by Elmer Rice, Don Juan in the play of the same title by James Elroy Flecker, two parts in Terence Gray's own play The Red Nights of the Tcheka, the Stage Manager in The Player Queen (also by Yeats), the Second Engineer in The Insect Play by the Čapek brothers, Prince Kamose in another Gray play called And in the Tomb and finally in June 1927 Don Pelegari in Pirandello's Each In His Own Way. Both Yeats and Shaw attended performances of their own plays. In 1927, he was one of a group of out-of-work actors including Laurence Olivier, chosen to perform in a "tryout" of R. C. Sherriff's Journey's End directed by James Whale at the Apollo Theatre in London, and later in 1929 at the Savoy Theatre which had been leased by the Chicago theatre manager Maurice Browne. It was a huge success, running for two years and making Maurice's name. He played the young officer Raleigh, who dies at the end of the play. In 1934, he went to the Old Vic Theatre where his interpretation of Shakespeare's "Richard II" was highly praised. It was as a result of this that he was invited to join Katharine Cornell in the United States. His first appearance on Broadway was in Romeo and Juliet opposite Katharine Cornell in 1936, but he made his biggest impact in Shakespeare's Richard II, a production whose unexpected success was the surprise of the 1937, theatre season and allowed Evans to play Hamlet (1938) (the first time that the play was performed uncut on the New York stage), Falstaff in Henry IV, Part 1 (1939), Macbeth (1941) and Malvolio in Twelfth Night (1942) opposite the Viola of Helen Hayes, under the direction of Margaret Webster. He also starred opposite Cornell in the 1935 production of George Bernard Shaw's St. Joan. Evans reprised his Broadway role in Dial M for Murder for a 1958 Hallmark Hall of Fame television presentation. Also pictured are John Williams and Rosemary Harris. When the U.S. entered the Second World War, he enlisted in the United States Army and he later was in charge of an Army Entertainment Section in the Central Pacific and played his famous "G.I. version" of Hamlet that cut the text of the play to make the title character more appealing to the troops, an interpretation so popular that he later took it to Broadway in 1945. Evans rose to the rank of Major by the end of the war. He shifted his attention to the works of Shaw, notably as John Tanner in Man and Superman and as King Magnus in The Apple Cart. In 1952, he starred as the murderous husband in the original stage production of Dial M for Murder. He also successfully produced Broadway productions in which he did not appear, notably The Teahouse of the August Moon. In 1956, Evans recorded an LP of stories from Winnie-the-Pooh. American television audiences of the 1960s will remember Evans as Samantha's father, Maurice, on the sitcom Bewitched. His real-life insistence that his first name was pronounced the same as the name "Morris" was ironically at odds with his Bewitched character's contrasting stance that it be pronounced "Maw-REESE". Evans also appeared in the fourth season of Daniel Boone starring Fess Parker playing a French impresario "Beaumarchais." He also played "The Puzzler" on Batman in a double episode storyline (which was common for that series) in December 1966. Continuing his American TV appearances, he guest starred in The Big Valley from the latter part of the fourth and final season of that western series in April 1969, an episode entitled "Danger Road". Evans had great impact onscreen as well. He played a diabolical villain in Kind Lady (1951; co-starring Ethel Barrymore, Keenan Wynn, and Angela Lansbury); Emperor Antoninus in Androcles and the Lion (1952); and Sir Arthur Sullivan in The Story of Gilbert and Sullivan (1953). 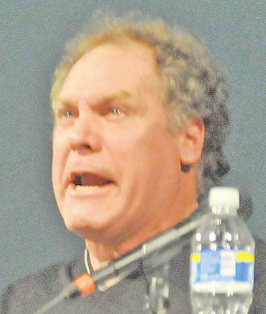 Evans appeared memorably in two 1968 films: as the evolved orangutan, Dr. Zaius in Planet of the Apes (and the 1970 sequel Beneath the Planet of the Apes) and as the doomed "Hutch", who attempts to warn his friend, the title character, Rosemary Woodhouse, in the thriller Rosemary's Baby, of the true Satanic nature of her neighbours, Roman and Minnie Castavet (played by Sidney Blackmer and Ruth Gordon). In bringing so much Shakespeare to American television in such a short span of time (between 1953 and 1960), Evans was a true pioneer. This had never been tried before – at least, not in the U.S. 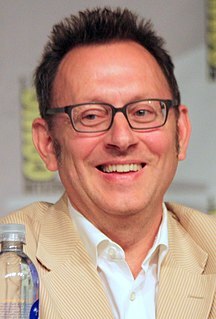 He firmly believed that it was an actor's job to "lead public taste, not to play to public taste". Evans brought his Shakespeare productions to Broadway many times, playing Hamlet on the Great White Way in four separate productions for a record grand total of 283 performances. He and Dame Judith Anderson starred on Broadway several times in Macbeth. Their performances were widely regarded as the definitive portrayals of these characters, although one notable dissenter was Orson Welles, who in Peter Bogdanovich's book This Is Orson Welles, stated that Evans, as an actor, was "worse than bad – he was poor". Evans appeared on Broadway as Hamlet four times, but the productions of the play that he appeared in were consecutive revivals of it – no other actor played Hamlet on Broadway between 1938, when Evans first played him there, and 1946, which marked Evans's last Broadway Hamlet. He is very likely the only actor to have accomplished this, so far. Although he had taken U.S. citizenship in 1941, by the end of the 1960s, Evans returned to Britain. Aside from an infrequent trip to the United States and occasional visits to retired actors in financial need (as a representative of the Actors' Fund, of which he was a longtime trustee), he lived quietly near Brighton. He never married, and was survived by a brother, Hugh, of London. Evans died, aged 87, in Rottingdean, East Sussex, England, reportedly of heart failure as a result of a bronchial infection. ^ Folkart, Burt A. (1989-03-14). "Maurice Evans dies at 87: Brought Shakespeare to TV". Los Angeles Times. Retrieved 2018-07-23. ^ "Maurice Evans Biography". Film Reference. 2008. Retrieved 8 January 2009. ^ "Maurice Evans : Villains : Bat-Mania – The 1966 Batman Tribute Website". 66batmania.com. Retrieved 20 May 2017. ^ "Search". Television Academy. Retrieved 27 September 2015. ^ "Maurice Evans, Stage Actor, Dies at 87". The New York Times. 14 March 1989. Retrieved 12 May 2010. ^ Welles, Orson (1998). Amazon.com: This Is Orson Welles (9780306808340): Orson Welles, Peter Bogdanovich, Jonathan Rosenbaum: Books. ISBN 978-0306808340. ^ The Broadway League. "Hamlet – IBDB: The official source for Broadway Information IBDB: The official source for Broadway Information". ibdb.com. Retrieved 27 September 2015. ^ Petition for Naturalization as a United States citizen, ancestry.com; accessed 20 October 2015. ^ Obituary, nytimes.com, 14 March 1989; accessed 17 December 2016. Wikimedia Commons has media related to Maurice Evans (actor). Maurice Evans papers, 1934–1970, held by the Billy Rose Theatre Division, New York Public Library for the Performing Arts; accessed 7 October 2015. Performances in Theatre Archive University of Bristol; accessed 20 May 2018. Obituary, nytimes.com; accessed 7 October 2015. 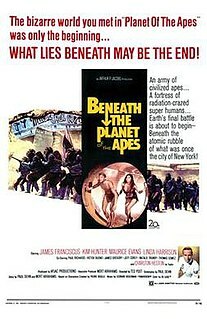 Beneath the Planet of the Apes is a 1970 American science fiction film directed by Ted Post and written by Paul Dehn. It is the second of five films in the original Planet of the Apes series produced by Arthur P. Jacobs. The film stars James Franciscus, Kim Hunter, Maurice Evans, and Linda Harrison, and features Charlton Heston in a supporting role. Richard Waring was an English-American actor. He is perhaps best remembered for his role in the film Mr. Skeffington (1944). Noel Willman was a Northern Irish actor and theatre director. Born in Derry, Ireland, Willman died aged 70 in New York City, United States. A. Lehman Engel was an American composer and conductor of Broadway musicals, television and film. Jay Olcutt Sanders is an American actor who has worked in theatre, film, and TV, known for JFK (1991). He frequently appears in plays Off-Broadway at The Public Theatre. The Voodoo Macbeth is a common nickname for the Federal Theatre Project's 1936 New York production of William Shakespeare's Macbeth. Orson Welles adapted and directed the production, moved the play's setting from Scotland to a fictional Caribbean island, recruited an entirely Black cast, and earned the nickname for his production from the Haitian vodou that fulfilled the role of Scottish witchcraft. A box office sensation, the production is regarded as a landmark theatrical event for several reasons: its innovative interpretation of the play, its success in promoting African-American theatre, and its role in securing the reputation of its 20-year-old director. Edward Atienza was a British stage and film actor. He made his first London theatre appearance in the role of Mole in Toad of Toad Hall at the Prince's Theatre. Whitford Kane was a noted Irish-born American stage and screen character actor remembered for playing the First Gravedigger in numerous productions of Shakespeare's Hamlet and by the students that attended his drama classes over a career that spanned nearly six decades. By the end of his long career, Whitford Kane's theatre credits had grown to fill three columns in John Parker's Who's Who in the Theatre. Leon Quartermaine was a British actor whose stage career, in Britain and the United States, extended from the early 1900s to the 1950s. Eric Maxon (1882–1963) was an English stage and early film actor and member of the Royal Shakespeare Company for whom, for a period, he also designed the costumes. This is a comprehensive listing of the theatre work of Orson Welles. There isn't one person, I suppose, in a million, who knows that I was ever in the theatre. Robert Pastene was an American actor who appeared films, television and on stage. He acted in a variety of television dramas during what is known as the “Golden Age” of television throughout the 1950s and 60s. On Broadway he performed in plays by Shakespeare, Strindberg, Brecht, Aeschylus, Shaw and Lillian Hellman. In the 1960s and 70s he had a significant career at the Guthrie Theater in Minneapolis, which began in 1963 with the theater’s inaugural season.